Bladder cancer is a form of cancer that commonly begins in the cells lining the bladder, also known as transitional epithelium. 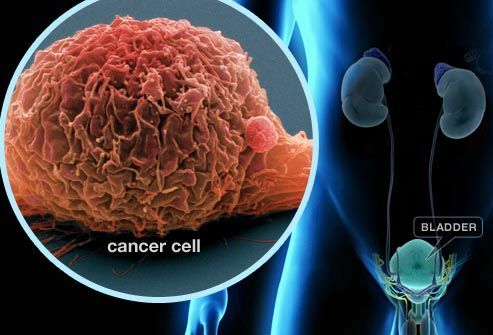 As with all cancers, it can develop into a life-threatening illness - though most cases of bladder cancer (about 50%) are diagnosed at an early stage when the disease is highly treatable. Bladder cancer is most commonly found in older people, with about 9 out of 10 diagnosed with bladder cancer over the age of 55 and the average age at the time of diagnosis being 73 years. In 2004, bladder cancer was the 4th most prevalent cancer in men and the 11th most prevalent cancer in women.1 For 2014, the American Cancer Society estimates that there will be around 74,690 new cases diagnosed and 15,580 deaths from bladder cancer.2 The National Cancer Institute (NCI) define cancer as "a term for diseases in which abnormal cells divide without control and can invade nearby tissues. "3 It can affect all organs of the body including the bladder - the organ that collects urine from the kidneys prior to it leaving the body through urination.